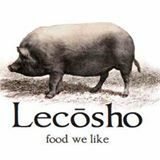 Lecosho opened in downtown Seattle in September of 2010. With a casually elegant atmosphere of high ceilings, wood-trimmed banquettes and an open kitchen,we feature European-influenced dishes using the best ingredients available from the Northwest: herbs, cheeses, wild mushrooms, seafood - and locally and sustainably farmed pork, lamb, chicken & beef. We make our own pasta and are known around the city for our house-made sausage and charcuterie. We offer classic cocktails and a unique well-chosen selection of wines & beers. With a combined 40+ years of experience in the restaurant industry, the owners Jill Buchanan and Matt Janke worked together in the early 1990s at a variety of Seattle restaurants. Jill later moved from the area to establish her own restaurant il Naso in Sun Valley, Idaho. Matt opened his own place, Matt’s in the market, in the summer of 1996. Years later Jill & Matt ran into each other by chance and decided it was time to work together again. The result was Lecosho, voted one of Seattle’s 10 best new restaurants of 2010. Owner operated, our goal & desire is to always be on hand to serve you simple, well-prepared food – “food we like”, as we say. Our candlelit ambience and attentive, knowledgable staff create an atmosphere you will enjoy.